Additional Info: This is our much loved family owned holiday home. It is packed with extras inc FREE WIFI and the use of an Xbox with games. Bed linen is included with beds made for your arrival. Full heated with electric wall heaters. Parking directly outside and a picnic table. Ideally located near the main complex for a great family holiday. Short Breaks available all year round £100 - £400. Monday or Friday starts preferred. We can be flexible on dates please ask. 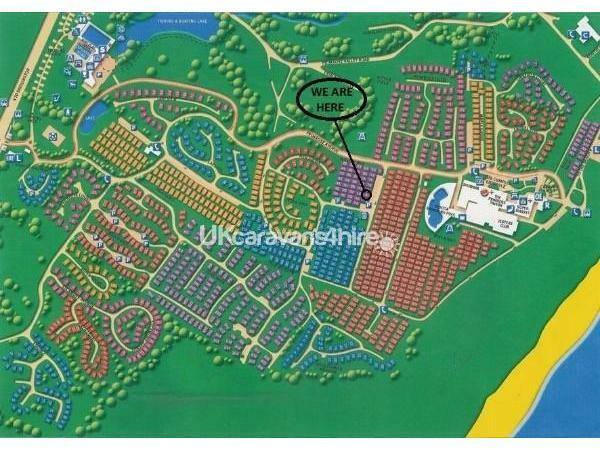 Our lovely family owned Willerby Vacation caravan is ideally situated in Willow Way. Less than 3 minutes walk to the main entertainment complex, splash pool, shop, restaurants and bars. The children's playground and launderette are less than 1 minute away. The fun fair, lakeside pool, boating lake, sports area and bike hire are only 5 minutes away. This is 1 of 2 caravans we own the other being next door reference 956. The caravan has had new carpets throughout also a brand new cooker and all new kitchen & lounge cupboards recently and is like walking into a brand new caravan. Free WIFI for all our guests and a Bluetooth Speaker were installed in 2016. In 2015 the lounge and dining seating was replaced, not just recovered but replaced with new foam and fabric, with matching curtains it looks amazing!! Each winter we carry out maintenance on our caravans so they are in excellent condition ready for your holiday. Directly in front of the caravan there is a row of car parking spaces, with a flagged path leading directly to the door. No need to walk over grass or mud in wet weather. There is room for 1 or 2 cars at the side of the caravan on the grass, we have always managed to park in front, so it leaves a nice area for children to play. The caravan sleeps 6 in three bedrooms. A double with a proper silent night mattress with memory form topper, not the normal thin caravan mattress, plenty of storage, a triple wardrobe, small set of drawers, cupboards and a shelf above the bed, bed side tables and a dressing table. Two twin bedrooms each with cupboards and over bed shelves, bed side table, and a single wardrobe. All bedrooms have electric panel heating. The curtains are much thicker than standard Haven curtains which makes a big difference on summer mornings especially if you have children and want a lie in. Please note there is NO SOFA BED. Our caravan is wider than a standard van, 12ft instead of 10ft, and this is very obvious in the spacious lounge. It comes with a very efficient gas fire, a 32" television equipped with free view, a DVD player with a selection of DVD’s, and games and a PlayStation 3 with Games. The dining area has wrap round seating and two stools. It has a toilet with sink and a separate heated shower room also with a sink. This is handy when a family is trying to get ready at the same time. The shower is also bigger than the standard caravan shower. Tesco has recently opened a supermarket in Filey for those wanting a 'big shop' but the mini market is quite well stocked. Morrison’s and Sainsbury are in Scarborough. Thank you for your perfect feedback. Hopefully see you both soon. As always Pat your most welcome.